Carpal tunnel syndrome has a variety of treatment options available. As our society becomes more and more reliant on computer usage, texting, and the like carpal tunnel issues are more and more common. Luckily Elite Sports and Spine of Totowa offers physical therapy in Passaic County to deal carpal tunnel syndrome treatment with this issue and many other conditions resulting from repetitive motions. Treatment options for carpal tunnel syndrome treatment include stretching, strengthening, active release technique work, and deep tissue therapy among others. The pain can be excruciating and when the pressure can be taken off of the nerve causing the pain and symptoms you can experience great relief. Our physical therapists in Totowa can help you choose the method of treatment that works best for you. We prefer to avoid surgery whenever possible and will do what it takes to help you get rid of the pain you are experiencing. One of the best ways to address carpal tunnel syndrome is to catch it early on. If you are aware of pain related to typing, texting, and other continuous motions you make the best thing you can do is give yourself frequent breaks. Once you pass this point learning correct stretching and posture techniques can be quite helpful in treating the pain. These exercises can be done during the day during breaks from your activity. When stretching and posture alone are not enough our team at Elite Spine and Sports Care of Totowa can offer deeper therapy that helps alleviate the pressure that is being placed on your nerves. Our educated and experienced physical therapists can use an active release technique or deep tissue laser therapy to help face this pain. Carpal tunnel syndrome is a result of overuse. 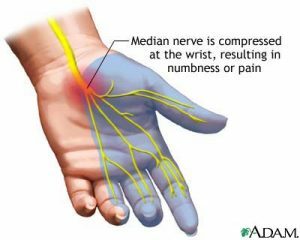 Extended computer use can cause carpal tunnel which can present itself as numbness, tingling, and pain in the hand. This can be quite uncomfortable. Choose the physical therapists in Passaic County with a great reputation for helping people address their around pain and prevent future injuries. Elite Spine and Sports Care of Totowa can help you with your carpal tunnel syndrome issues and carpal tunnel syndrome treatment.